1) The ice cream gossip mill is in full swing, with a couple of Bay Area favorites rumored to be adding locations in the East Bay. Tablehopper was the first to report the rumor that Smitten, the liquid-nitrogen-based ice cream shop in San Francisco, might be adding a location in Rockridge. Diablo Dish got confirmation from the owners and, after some sleuthing, found out the potential location: Looks like the owners are trying to get a conditional use permit to take over the former Great Harvest Bread Co. location (5800 College Ave.). An additional piece of ice cream gossip, also courtesy of Diablo Dish: The owners of recently reopened Berkeley soft-serve fave Sketch (2080 4th St.) are looking into adding a second location in the East Bay. 2) According to Chowhound poster Ruth Lafler, East End Pizza (1650 Park St., Alameda) is now open in its newly remodeled (and much larger) digs in the Alameda Marketplace, having expanded into the former Ching Hua space adjacent to East End’s original spot. Thanks to the roomier setup, East End is now also able to serve more than just pizza: chicken confit, angnolotti (a kind of stuffed pasta) hand-cut pappardelle, various bar snacks, and more. 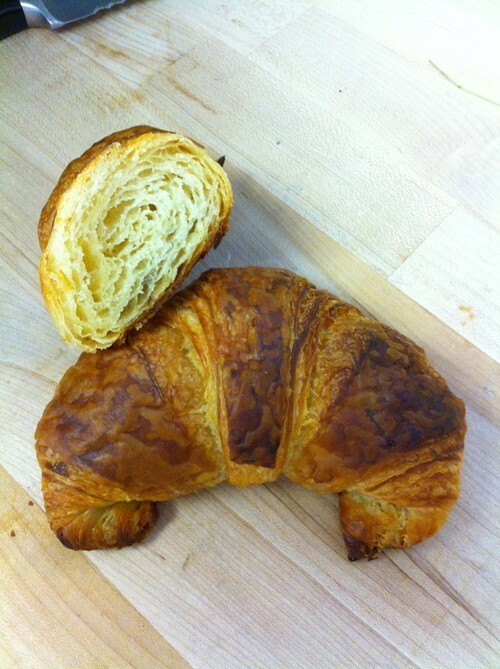 Coming soon: Croissants at Nick's. 3) Nick’s Pizza (6211 Shattuck Ave., Oakland) is adding breakfast and breads to its repertoire, as chef-owner Nick Yapor-Cox is teaming up with his friend Aron Ford — an Acme, Arizmendi, and Vesta Flatbreads alum — to launch a bread and pastry program at the restaurant on June 20. The signature item will be something Yapor-Cox and Ford are calling the Bushrod Rustic Loaf ($4.25), made with a sourdough starter and a blend of whole wheat and white flours. Meanwhile, Ford has developed a line of sweet and savory croissants, and there will be scones and muffins, too. Check out the full morning menu here. Starting on June 20, Nick’s will be open for coffee and pastries at 8 a.m., Tues.-Sun. 4) By next week, Bittersweet Cafe will have opened its new location in downtown Berkeley, at 2015 University Ave., Berkeleyside reports. 5) Dishcrawl is organizing a “crawl” through four Old Oakland restaurants on Wednesday, June 19, starting at 7 p.m. Tickets are $45. As with other Dishcrawl events, participants will have a chance to meet some new people and sample dishes at all four dining establishments. Typically, the identities of the restaurants aren’t revealed ahead of time, but I have it on good authority that one of the stops will be … dun dun dun … Miss Ollie’s. 6) Just in time for Father’s Day, the Jack London Square pizza restaurant Forge (66 Franklin St.) has launched a weekend brunch program, available 11 a.m.-3 p.m. on Saturdays and Sundays. Current offerings include a Spring Scramble (with asparagus, Fiscalini cheddar, and herbs) and versions of brunch classics like Eggs Benedict and Huevos Rancheros. Or you can always stick with the pizza. 7) Speaking of Father’s Day celebration ideas, Tribune Tavern is kicking off Sunday dinner service with a special (and characteristically meat-heavy) Father’s Day dinner menu this Sunday, June 16, from 5-10 p.m.: spicy barbecued spare ribs, roast beef trencher, whole roasted fish, and a root beer float with beer ice cream — holla. 8) Chowhound poster Robert Lauriston reports that Uptown Oakland’s Hibiscus (1745 San Pablo Ave.) is closed for renovations and remodeling. The restaurant website confirms that fact, though no additional details are available for now. 9) Happy one-year anniversary to Hopscotch (1915 San Pablo Ave., Oakland). To celebrate, the restaurant will be serving a $30 prix-fixe menu through Friday, June 15. Check out the menu here. 10) Finally, ICYMI, this week I talked to Umami Mart’s owners about the snacky Japanese food items customers might expect to find at their new in-store konbini. I also profiled Sista Sandwich, a new gluten-free food start-up.